Imprisoned for murder, Erik Lensherr is freed from prison in 1973 so that his magnetic powers might prevent another murder, one that would have grave repercussions for the future of mutantkind. Our second Michael Fassbender Minimate has just as good a likeness as the first one. Surprisingly, this time they opted to mold him a new helmet, rather than repainting an existing one. His costume is purple and black, with tampographed details on his shirt and legs. He wears a cape, because it makes him look impressive when he's flying. And he can fly, thanks to the inclusion of a hover stand - since Future Magneto didn't come with one, you can trade it back and forth. The set also includes some brown hair for those times you want him to take his helmet off and be controlled by Charles. In 1973, Raven Darkholme plans to kill Bolivar Trask for crimes against mutantkind. But doing so will lead to a dark future, and she will have to go through her old firends Erik and Charles to do it. 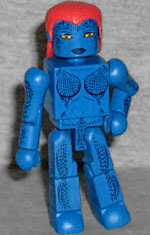 Hey, Mystique might not have gotten her Marvel Select figure, but at least she's got a Minimate! She's actually had one before, but that one was wearing the full costume, while this time, Jennifer Lawrence is completely naked (a fact [and a phrase] which should do wonders for our Google hits). Obviously all her scales are painted on, meaning this could pull double-duty as an X-Men 1-3 movie Mystique. Her hair is not as vibrant as before, but it's a new mold that looks very nice. 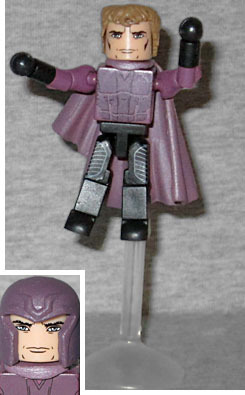 Magneto has the additional power to alter the shape of his helmet while incarcerated. Not only is his Day of Future Past helmet completely different from his First Class helmet, his helmet in X-Men 2 is also slightly distinct from the one he wore in the first movie. Ah, but remember: he spent a lot of time between First Class and DOFP not incarcerated! Only a year. It just seems weird that he customized Shaw's Russian helmet to look like his iconic comic book helmet but then quickly ditched it for a brand new one of a completely different aesthetic that had the same anti-telepathy properties.